Steve Madaras, PADI Course Director #17232, has had a love of the sea since he was a young boy. He became a certified diver in the early 70’s in California. The sport was so new that you could buy a regulator at Sears & Roebuck. It was a double hose unit and inside the box was a small note that read “may require some instruction”. There were no certification agencies and most divers carried knives and handmade pole spears. They were almost exclusively hunters and wetsuits were for sissies! If it sounds like Mike Nelson and the television series “Sea Hunt”, it was pretty much just like that except no one swam after you and cut your air hoses… thank goodness! Diving is Steve’s passion and “SCUBA LUV” has been his lifelong adventure. Now in his 40th year of teaching diving, Steve has taught thousands of folks how to dive…and their kids….and their kid’s kids! The “SCUBA LUV” name has been around for more than 40 years! The original store was in Thousand Oaks, California. Steve’s boat, “The Scuba Luv’r” was a 65’ live-a-board operating out of Ventura Harbor and carried divers daily to the Northern Channel Islands. Steve was the first to build a Coast Guard approved shark diving cage and conduct shark diving for recreational divers! His second location was in Woodland Hills, California where he met and certified ( of course) his wife, Diana. In 1994, when the Northridge Earthquake hit, they decided to move the operation to Catalina Island. Now known as “Catalina Scuba Luv”, Steve continued his quest . Taking on partners, Bob & Tina Kennedy, the Madaras’s and the Kennedy’s had eight very successful years together. The Kennedy’s already owned a 65’ dive boat, “The King Neptune” and Steve added to the fleet his six pack known as “The Prince Neptune”. The “Prince” soon became a very popular boat in Catalina. Steve was the only dive boat operator offering guided dives and photography in California. All the other boats up to that point had the attitude of “same day…same ocean…see ya”. Of course, those days are gone and legitimate dive operators all conduct thorough briefings and provide licensed dive guides. Steve is also an Underwater Stuntman, Trainer & Consultant. 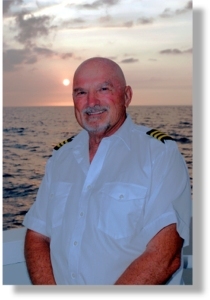 He holds a 100 Ton United States Coast Guard Captain’s License and has driven dive boats for more than twenty years. Other certifications include PADI Course Director, Emergency First Response Instructor Trainer, TDI Instructor Trainer, Rebreather Instructor Trainer, Dan O2 Provider Instructor Trainer, President of the Catalina Mooring Project ( a non-profit organization dedicated to preserving the marine environment now operating in Hawaii), President of Aqua Images ( an underwater videography & digital photography service), Graduation certificate from the famous College of Oceaneering and holder of the prestigious “California Scuba Service Award”. His movie credits include: Jaws, Leviathon, The Abyss, Navy Seals, Raising Cane, Internal Affairs, Hook, Addams Family Values, Water World, The Mask, Star Tec-Generations, What Lies Beneath and Castaway. ( for more information about Steve’s movie career see “www.aqua-images.com”). After moving to Maui in 2002, Steve & Diana worked in the dive industry on Maui for several years. Steve drove dive boats for several companies, including Lahaina Divers, and taught scuba , underwater photography and conducted PADI Scuba Instructor programs. In the Fall of 2006 he was asked to open up a scuba operation at two southside resort hotels, the Maui Prince in Makena and the Marriott Wailea in Wailea. He offered the first dives on Thanksgiving Day 2006. He and Diana did all the dives that day and SCUBA LUV MAUI was up and running! We invite you to come dive with us at SCUBA LUV MAUI. We feel we can share with you our years of experience and appreciation for the ocean and the marine environment. Let us take you on a scooter dive to the outer reef! We will take you to see an old tank and landing craft, turtle cleaning stations, schools of spotted eagle rays, point out the different species of eels, frogfish, reef fish nurseries and, December through May, hear the calls of the giant Humpback Whales underwater during your dive! Take an Introductory Dive with us and we will apply the fee towards your Open Water Certification! Become a PADI Scuba Instructor with us and beginning working in Maui! Come be a part of the SCUBA LUV TEAM!